Weeee're back! After a bit of a hiatus due to us all being busy bees with our own personal projects, we're happy to announce that we'll be hosting our first ever Beehive Winter Craft Fair! b) we have so many AMAZING vendors lined up! For more info and to learn about our awesome vendors, follow us on facebook and instagram! 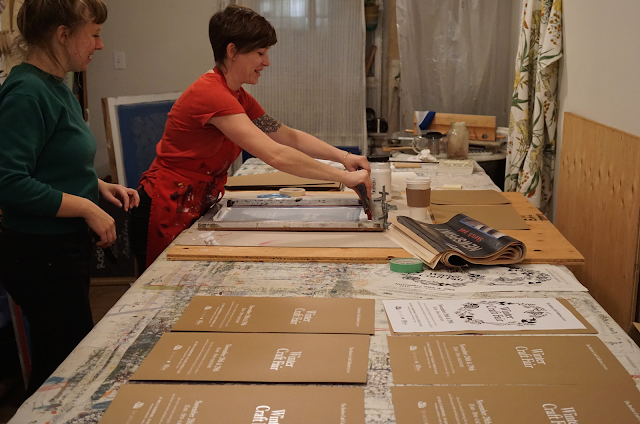 We had fun screen printing a whole bunch of posters for the show last week, so you'll likely see them around town. Woohoo! 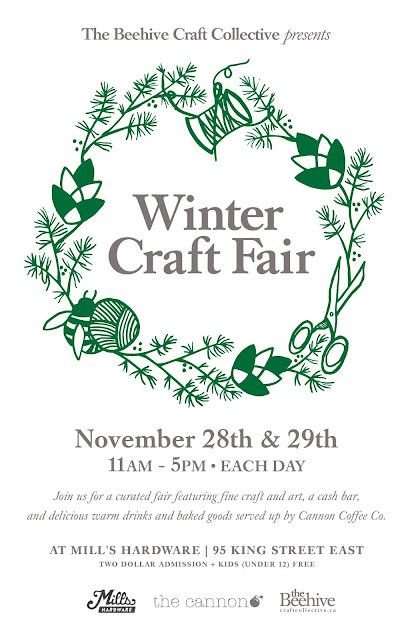 If you're on the hunt for some special locally made Christmas gifts or perhaps just a treat for yourself, make sure you come to this great event. We can't wait to see you there! 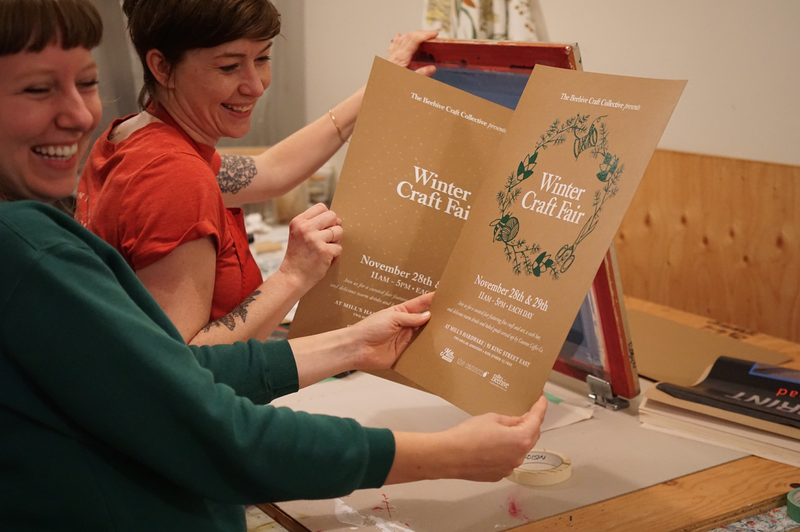 Aways back we presented on forming a craft collective at a symposium, and it made us think more closely about the value of being part of a group like the Beehive. Faced recently with a craft conundrum, I sent out smoke signals to the Bees and they responded in full-force. I was reminded of how lucky I am to have them in my life, ready to lend a hand, brainstorm ideas, and offer feedback that I trust through and through. The result: a most adorable window installation in one of the heritage vitrines at the Lister Block (28 James Street N), launching tomorrow as part of the January Art Crawl. The scene is a whimsical wintertime village glowing with colour, warmth and light and nestled in vintage quilts. Above the paper houses made by the Bees (and friends) are suspended thread "scribbles" by Amanda McCavour, emulating snowflakes falling on the village. This is all to promote Hamilton Winterfest (February 1-9) a community driven event program coordinated by the City that encourages people to get out, get together, and celebrate the beauty of the wintertime in Hamilton. Details at www.hamiltonwinterfest.ca. If you happen by the Lister Block, come in from the cold and enjoy our little village! 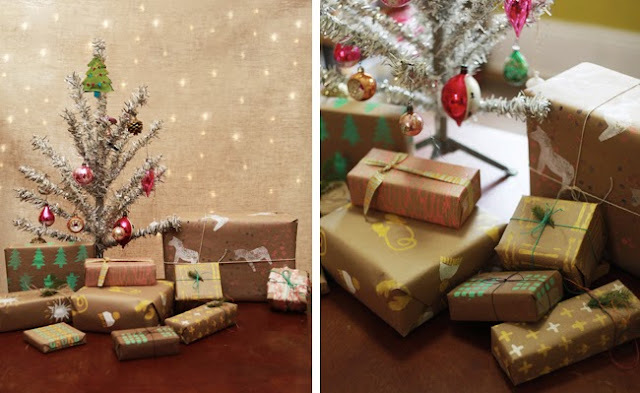 We're just a few days out from Christmas, so we thought we'd share some holiday cheer with you! As we all prepare for the upcoming flurry of parties and general yuletide coziness, we found some time to get together and get festive! We've begun an annual tradition of making wreaths out of fresh greenery sourced by our favorite local flower shop, i fiori. It's always a really nice night, and it's such a treat that we all get to go home with something that will add some gorgeous festivity to our homes. If you want to see more about how we make these wreaths, feel free to check out our post from last Christmas. This year we got bigger frames (20" instead of 18") which we found to be a bit more difficult, so our hot tip for you is to keep your wreaths on the smaller side! We think you'll find it more enjoyable and satisfying, and it will be a lot easier to make your wreath look nice and full. Now that we've done this two years in a row maybe we'll try something different next year - perhaps we'll venture out into boughs and garlands! Or maybe we'll try incorporating some other elements into the wreaths - pine cones, dried flowers, twigs, or maybe some crafted materials like felted wool or crocheted bits and bobs. Let us know if you have any suggestions! Speaking of boughs and garland, we saw a LOT of those last night! We took the Christmas Tour at Dundurn Castle, and spent the evening learning about how the holidays were celebrated around the year of 1855 by Sir Allan MacNab and his family. It was amazing for our collective to see how self-sufficient this family needed to be, as we explored the in-house brewery, candle-making room, pickling stations, and learned about how much intentionality was required to create the Christmas meals for the family and the servants in the home. Items like chocolate and oranges would need to be ordered 3-6 months in advance, but most food items were grown on site, to be harvested and preserved in time to be ready for the holidays. To keep things cold, ice blocks were cut out from the Hamilton bay each January, and stacked between layers of sawdust and straw, and the ice would stay frozen all year in the home's ice pit. Holiday decor was taken to an amazing level, with natural garlands and arrangements everywhere you looked. Oranges, a sign of wealth, were incorporated into the holiday decor, and were given as gifts adorned with cloves. The tour was amazing, and we highly recommend it to anyone looking for something unique to do over the holidays with friends or family. 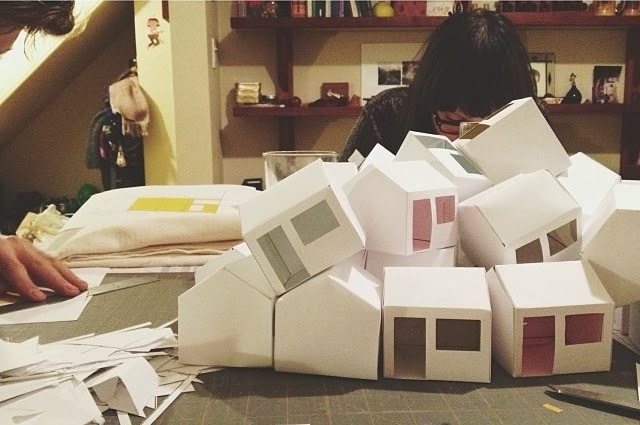 About a month ago we were asked by Etsy to contribute a DIY blog post to their 2013 International Advent Calendar. Everyday between December 1st and 25th, the Etsy Blogs will feature festive how-to as part of their DIY Advent Calendar Series, and the Beehive is honoured to be a part of it! Our blog post is featured today on Etsy's UK, France, Germany and Australia blogs. It's fun to see the Beehive in French and German, and we send a big collective hello to our friends in Europe and the Commonwealth! Check out our DIY blog post below, or visit the following links to see how we look in other corners of the world. Last year we were all quite taken with the beautiful wrapping paper that our Scout Bee Jenna made by carving her own stamps and printing them with white ink onto kraft paper. We just had to try it for ourselves! 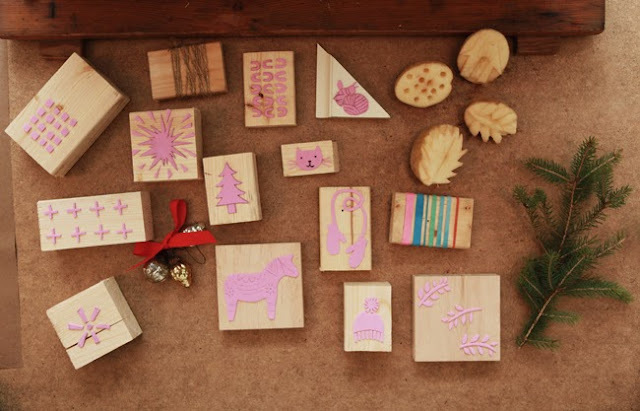 This is a simple, beautiful way to spruce up your holiday gifts with a handmade touch. 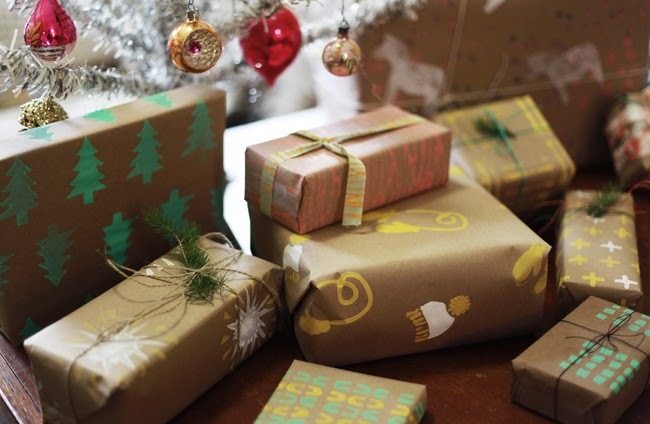 Using a variety of household objects to create patterns, these instructions will guide you through a few different methods - but feel free to play around, and come up with wrapping paper that really reflects all the thoughtfulness that you’ve put into the gift you’re wrapping. 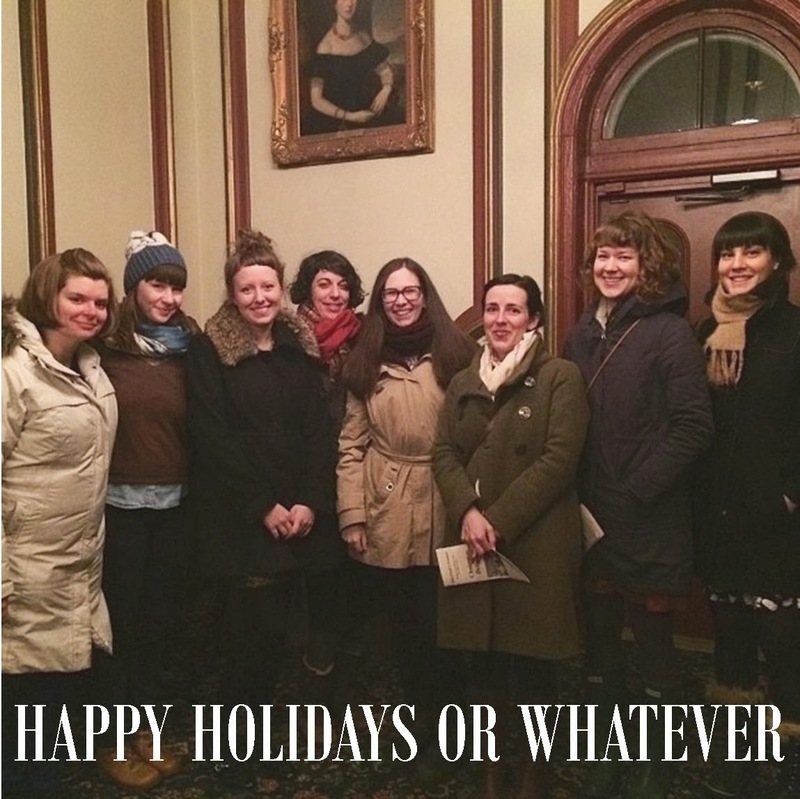 Warm holiday wishes from our Hamilton hive to yours! 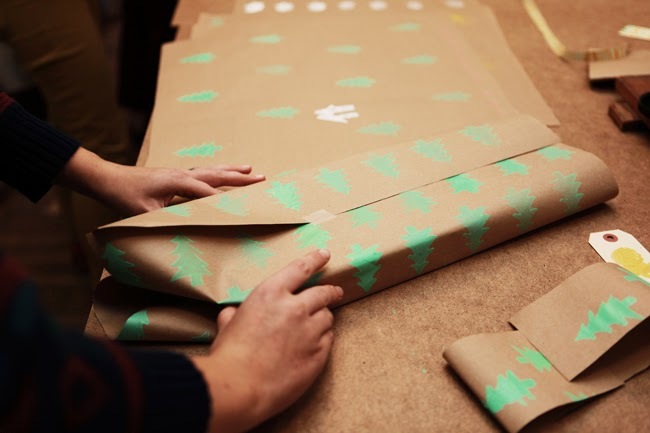 Prepare the amount of kraft paper and ribbon that you would like to print onto. 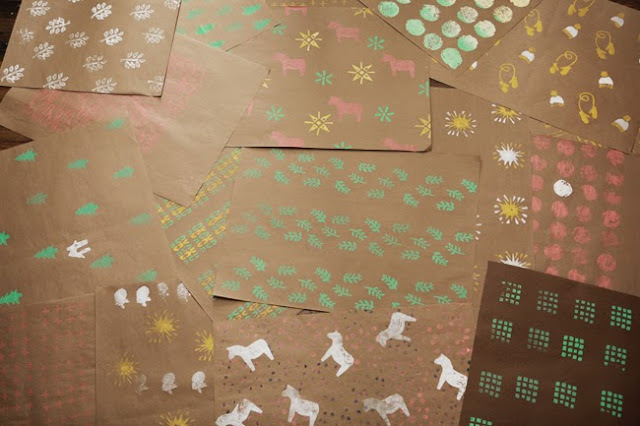 We used three different kinds of crafted blocks to print our wrapping paper and ribbon. 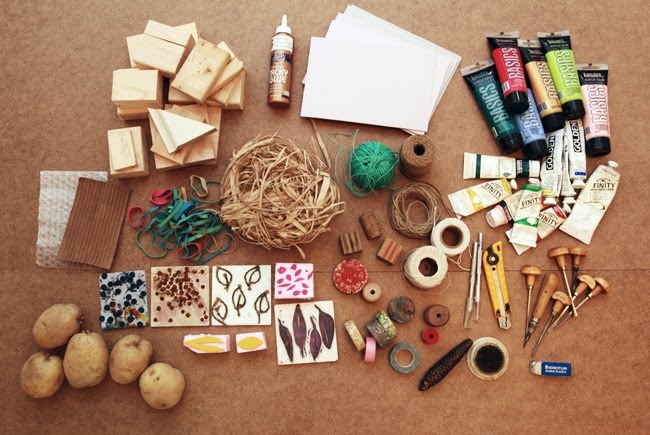 Scraps of wood, foam board or polystyrene can be used as the base for blocks with foam, string and string-like materials. Method 1) For blocks with craft foam: cut shapes and motifs and glue them to the block. Method 2) For blocks with string, you can both wrap the string around the block to create an allover texture, or draw a pattern or motif with glue on block base and lay string into the glue. Allow these blocks to dry thoroughly before using. Method 3) For potato printing blocks, first cut the potato in half. 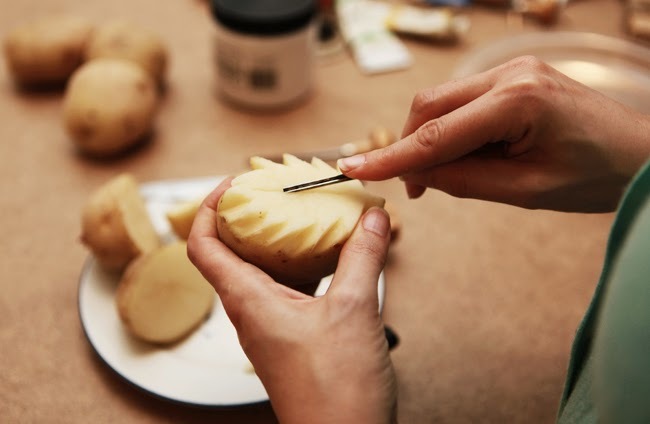 You can work with either positive or negative shape on the surface of the potato - cut a basic shape into the potato and cut away excess around your shape, or use the shape of the potato and carve you motif or pattern into the surface of the potato. 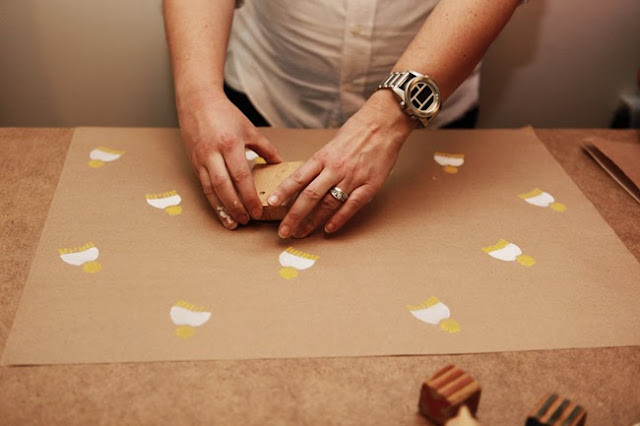 Using a paper towel, blot off excess moisture from the cut surface and allow the potato to dry slightly before printing with it. 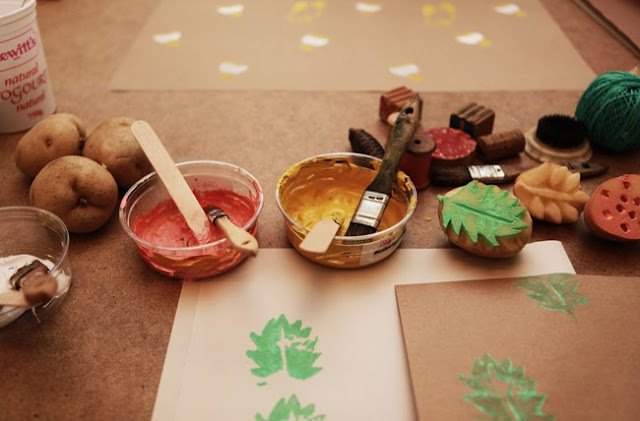 To print with your blocks, you can either brush paint directly onto the surface of the block, or use a sponge as a homemade stamp pad - just load the sponge up with paint, press your block into the painty surface of the sponge, and print away! After all of our printing was dry, we wrapped our gifts and tied scrap fabric and ribbon into bows for the final touches. 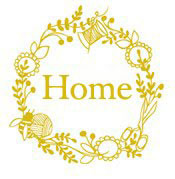 If you don’t print your own ribbon, you can use whatever else you have on hand for this - kitchen twine, raffia, string. You really can’t go wrong - it all looks cute! Play around with different combinations until you have the prettiest patterned packages. 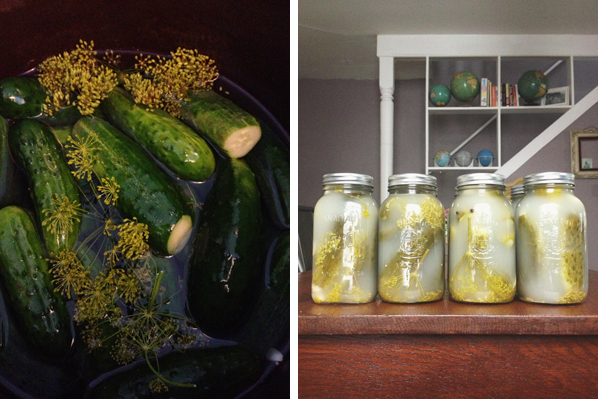 When I initially wrote this post a year ago, it felt like it would be ages before I got a chance to try my hand at fermented cucumbers again - especially since my failure affected me so heavily. But, as it always does, time flew by before I knew it. I was more cautious this year, less ambitious. I took home half the amount of cucumbers from the farmers' market than I had taken home the previous year. I kept a close eye on my crock, tasting one from my batch daily. Ten days later, I decided that they were ready, transferred them into clean jars and moved them into the fridge to stop the fermentation process. Altogether I ended up with eight jars of beautiful, cloudy, sour dills that reminded me of my grandmother's old-world recipe. The best part being that I just had to let nature work - no steamy vinegar kitchen, no hot water baths. The Bees have been talking a lot lately about the concept of "simple living" and came to the conclusion that our lives are anything but simple. 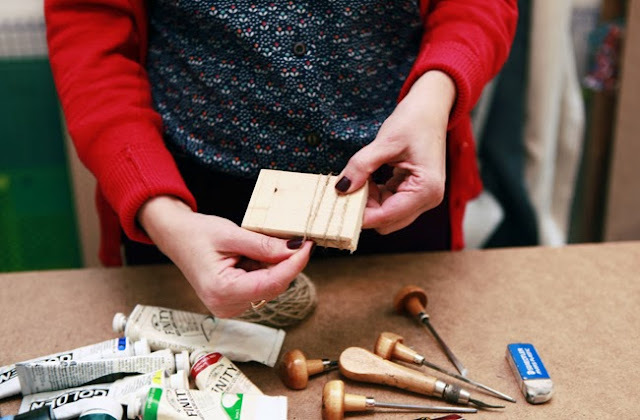 We voluntarily make more work for ourselves because we believe in the importance of making things by hand. I could simply go to the grocery store and buy myself a jar of full-sour pickles. I may have been even more inclined after failing last year to give up completely. But it was important to me to support my local farmer, important to me to provide for myself and my husband over the winter months, and important to me to learn from my past mistakes. Having achieved all of that this year gives me more fulfillment than could ever be bought in a store, and that's exactly why we do what we do. Summer is a busy time for bees, and it's always a busy season for us Bees, too. I always start the season with an ambitious list of things to accomplish, and in the end, have to concede I can only do about 1/4 of what I planned. A good part of my summers are always spent trying to capture the fruitfulness of summer, hoping to keep up with the fruits and vegetables as they ripen in the garden and appear at the farmers' markets. Last year while I was away in London, I didn't do any gardening or canning, and I really missed it! I made up for it perhaps too much this year, having made ten different kinds of jam, frozen and canned tonnes of fruit, and put by so many pickles, that my freezer is full and my store of empty jars is very depleted, and the season not finished yet. I hope my near and dear ones look forward to holiday gifts of jam, relish and pickles, because I can't possibly consume it all alone! I planted my own cucumbers this year because I love French cornichons, and wanted to try my hand at making my own. This entailed picking tiny cucumbers (about 5 cm long) every other day, and storing them in the refrigerator crisper until there were enough to make one jar. I used fresh tarragon from my herb garden in these pickles, as well as in the pickled radishes I made. Just trying to keep up with the cucumber plants, I made a ton of dills, piccalilli, and mustard pickle relish, just because I didn't want any to go to waste. In the end I had to stop picking them because there is no way one lady can eat that many cucumber sandwiches! By late August, the whole vegetable garden, including my patio herb garden, is totally out of control, and I feel a little overwhelmed! I prune the herbs and hang them to dry for later use in cooking, infusions and herbal tea. To keep up with the tomatoes, I've resorted to not only canning, but also oven-drying or freezing all those I can't eat. Oven-drying couldn't be easier. Simply halve small tomatoes, such as plum, paste or cherry tomatoes, or slice larger tomatoes, such beefsteaks or heirlooms. Place in a bowl, drizzle lightly with oil and toss to coat. 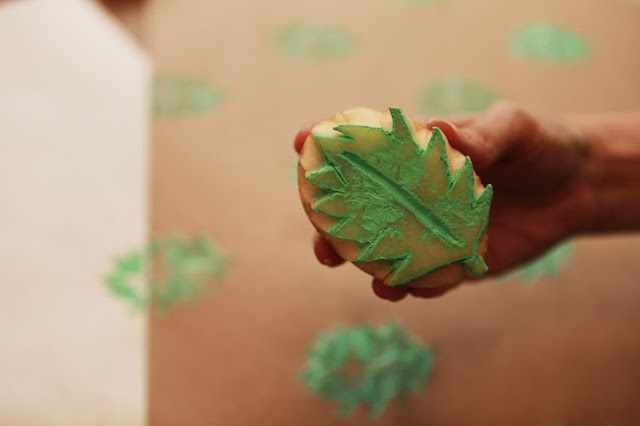 Spread in a single layer skin-side down over parchment lined baking sheets. Sprinkle with salt and pepper, and any herb you desire (thyme, rosemary or basil are my favourites). Place in a preheated 275 F oven, and leave for 1 1/2 to 6 (yes, six) hours, depending on the size and juiciness of the tomato, and desired dryness. I like to leave them semi-plump (about 3 hours). You can pack them in oil, but I prefer to freeze them on a tray and then place them, once frozen, into a freezer bag, to use in sauces and as pizza toppings in the winter for a taste of summer. We made mustard! This was something that had been on our to-do list for a while, and with sausage season just around the corner, we decided it was time to give it a try. How we usually do things in the Beehive is that we choose a recipe, make a list of ingredients, and then call dibs on whatever we have already in our homes. We had everything that was needed on hand except the actual mustard seeds, which were purchased from Dilly’s at the Farmers Market (the yellow seeds) and Nations (the black seeds). We all sat around the table, passed around the ingredients, and put them into our little jars, each making one cup of each mustard. This whole process took…about 15 minutes. 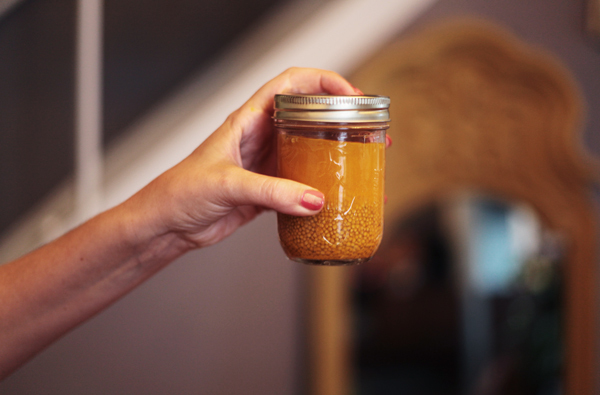 For some silly reason we thought this whole mustard-making-process was going to be intimidating and tricky, but it was literally just measuring ingredients into a jar…and that’s it! So we ordered some pizza, grabbed our crafts, and had an impromptu Beehive meeting. Then we waited 3-4 days, blended our concoctions at home, and reported on our findings. A few people found the lavender mustard a bit acidic, which might be because we substituted the water for white wine (assuming everything is better with wine – maybe not? ), but other than that, the mustards turned out just lovely. I blended the yellow mustard and it was perfect (so flavorful!) but I’ve left my lavender mustard unblended for a few weeks, just to see what happens with some more time. Know of any tried-and-true mustard recipes? Feel free to share them in the comments!